Sky Sports pundit Stuart Pearce believes that Chelsea ace Eden Hazard would be prolific if he was a Liverpool or Man City player. The season hasn’t started too badly for the 27-year-old considering he’s scored five goals and provided two assists in five Premier League outings, with his hat-trick at the weekend helping to seal a comeback win over Cardiff City. In turn, the Belgian international looks like he may well relish the opportunity to shine in Maurizio Sarri’s new style of play, which is ultimately based on dominating possession and quick, direct passing schemes to unlock the opposition. Despite that, Pearce believes that Chelsea won’t control enough games to help Hazard replicate the type of prolific form seen by Mohamed Salah last season, where the Egyptian was in sensational form in his first year at Anfield as he scored 44 goals in 52 games. Perhaps under Antonio Conte and previous managers, Pearce would have been spot on in his assessment as although Chelsea have been successful, they haven’t played a brand of football where Hazard has been able to establish himself as an elite-level player. However, there is a counter argument to suggest that he could be proved wrong this season, as with Sarri’s influence on the team in playing a more possession-based game which sees them create plenty of chances while they’ve scored 14 goals in five league games so far, this could be the year Hazard really kicks on. 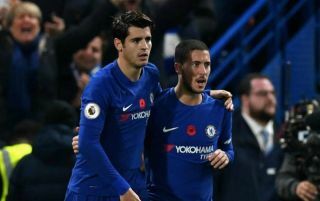 Consistency will be the crucial factor, but the early signs are promising and it remains to be seen if Hazard can emerge as the most potent goalscorer at Chelsea with the likes of Olivier Giroud and Alvaro Morata not doing enough to suggest that they can do it alone.